Daily Illuminator: Heaven's World Under Attack! Hello? Oh, Hell . . . Attack Underworld, Heavens! July 11, 2011: Heaven's World Under Attack! Hello? Oh, Hell . . . Attack Underworld, Heavens! Like a good palindrome, there are often two mirrored sides of any struggle. Take the ongoing war between Heaven and Hell (or Hell and Heaven, depending on your viewpoint). Regardless of what side of the conflict you're on, if you're one of the angels or demons from In Nomine, you'd like to know the hows and whats of where you're coming from and going to. 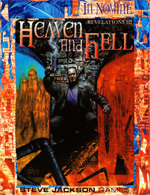 That's when it comes in handy to have In Nomine: Heaven and Hell -- newly added to e23. This supplement also comes with detailed write-ups for six Superiors: three Archangels (Dominic, Yves, and Zadkiel) and three Demon Princes (Asmodeus, Kronos, and Mammon). Wrapping it all up is the complete adventure "No Dinero," a Lower East Side conflict that takes an unexpected twist . . . So if you're still making summer vacation plans, you may want to pick up a copy of In Nomine: Heaven and Hell. It's a guide to places you'll remember for the rest of your days!